I actually wanted to mention that. Thank you all for your kindness over the last 6 months as I transitioned into my new career path! I can't believe how much I love my new job. It was a lot to take on, but I'm happy to say that things are going well. I'm hoping 2014 will slow down a little to allow me back into blogging regularly. Now, I can't make guarantees because life changes so quickly, but my plan is ease back into it, making sure I cover all the reviews I owe. If you have questions or would like to talk to me personally, please contact me at CrystalsCrazyCombos@gmail.com. I had to pull back from my social media, as it became too much for me. However, I've been having fun getting back into chatting and polish shopping!! With that, of course I had to snag some new pretties that I couldn't resist!! So between all my untrieds, the polishes to review, and the new ones on the way - I'll have plenty to keep myself busy!! I hope no one minds a mix of old and new, since sometimes the older polishes can be hard to find. Again, I can't thank you all enough. I put this huge pressure on myself about all of this, but it seems you all understand :-) That means so much to me. My blog is to share what I know and what I've tried, so to be received and loved by the community is the greatest gift. I wish you all the best in 2014!! Let's have a great year!! 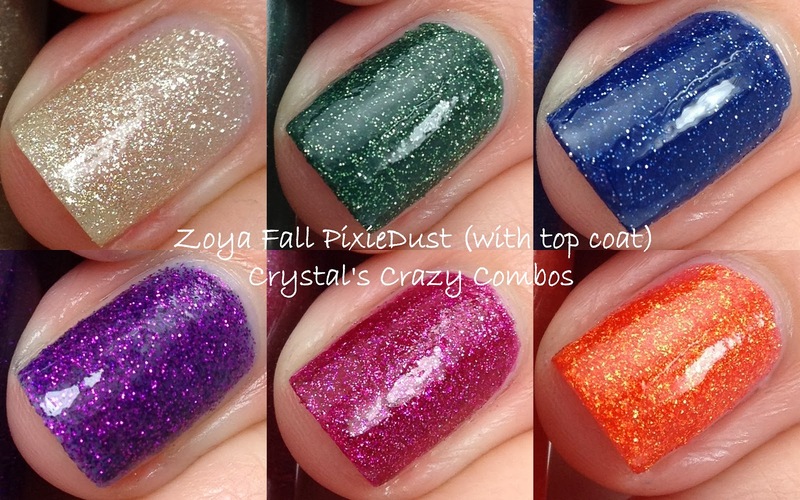 Anyway, in case you forgot (hehe) here is the Zoya Fall PixieDust without top coat! 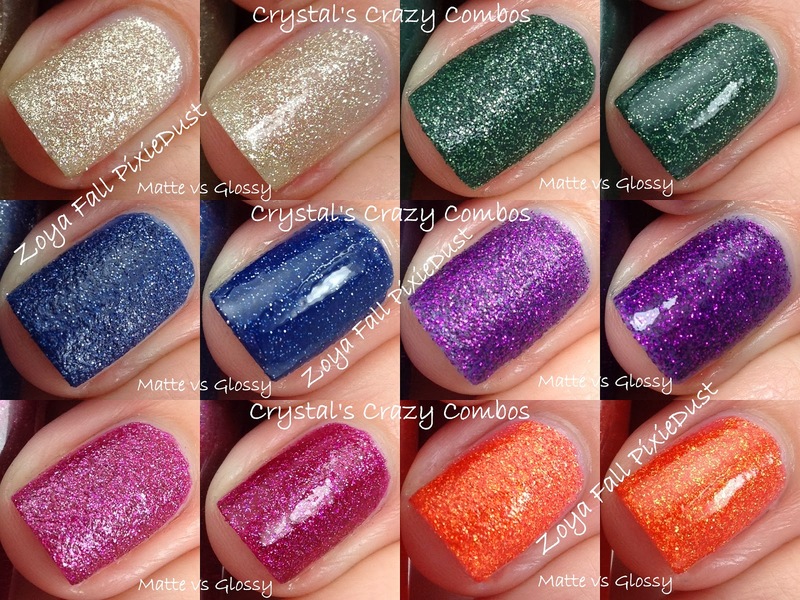 These gorgeous PixieDust colors are available through http://www.zoya.com/ (directly listed HERE) for $10 each. Also, a great promotion is available for 3 free* polishes!!! (*there is a $12 Shipping & Processing fee) Read more information HERE. If you spend $25 though, you can get free shipping! So let's look closer at each shade!! Lots of pics ;-) First up, Tomoko. This is 1 coat alone. Isn't it stunning? So elegant and easy for a quick mani! So sparkly too! And here is Tomoko with 2 coats. I added KBShimmer Clearly on Top to the 2 coats of Tomoko. Beautiful! Close up! Love that glitzy finish! Next up, Chita! Here is 2 coats. It's so close to being a one coater! I didn't want to have it too thick for photos, but I bet you could get away with 1 thicker coat! Here is Chita with 2 coats and topped with KBShimmer Clearly on Top. It's such a beautiful forest green. I just love it! The beautiful blue Sunshine with 2 coats! Another almost 1 coater! And here is Sunshine with 2 coats topped with KBShimmer Clearly on Top. I did add another coat of Clearly on Top for the picture below. I LOVE it so glossy - it's like stars in a (not so dark) night sky! Here is Carter with 2 coats and Clearly on Top by KBShimmer in my horrible bedroom lighting. It sparkles beautifully though, so I had to share! Carter with 2 coats and Clearly on Top. Next is Arabella. Shown with two coats. Arabella with 2 coats and KBShimmer Clearly on Top! Love the sparkle in this one too! Close up! Check out that hot pink in it! And last, but not least, 2 coats of Dhara. Here is Dhara with 2 coats and Clearly on Top by KBShimmer. It's glowing!! Love the gold with the orange. It always adds such depth! Blurred in the ring finger shows off that sparkle! 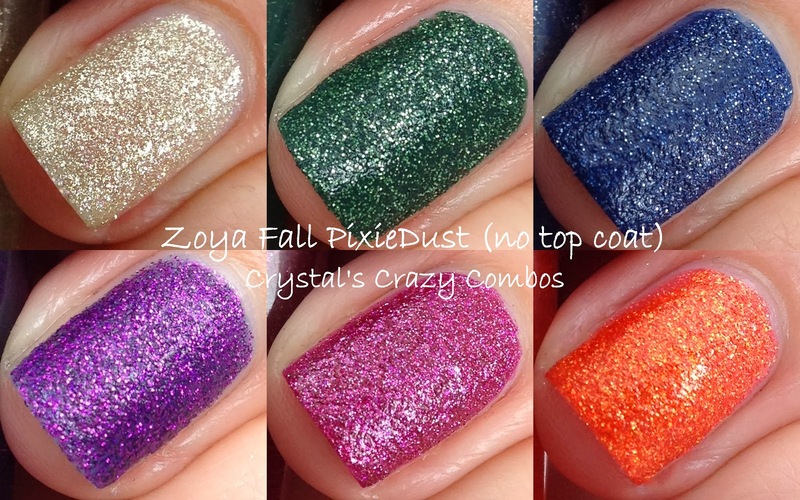 In case you missed above, these gorgeous PixieDust colors are available through http://www.zoya.com/ (directly listed HERE) for $10 each. Have a great day!! If you're snowed in like we are here, stay safe and warm!! If you're somewhere tropical - you stink. haha ;-) just kidding! But I am jealous!! now I want to put on Dhara. :) gorgeous pictures!! I absolutely love this collection. So many vibrant colours to enjoy! Love this collection. Your swatches are amazing! Adore the green with the TC!